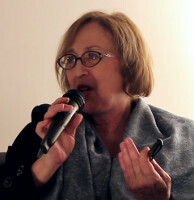 Anna Giza-Poleszczuk is a Polish sociologist and prorector with responsibility for development and financial policy at the University of Warsaw. She graduated from the University of Warsaw’s Institute of Philosophy and Sociology, gaining her habilitation there, before becoming an employee in the Institute’s Department of Social Psychology, where she specialises in evolutionary sociology and marketing from a sociological perspective. Her latest publication was Rodzina a system społeczny. Reprodukcja i kooperacja w perspektywie interdyscyplinarnej [The Family and the Social System. Reproduction and Co-operation from an Interdisciplinary Perspective] (Warsaw University Press, 2005). Outside of academia, she directs The Dockyard Centre for Societal Research and Innovation and has previously worked as the director of market research and as a communications advisor for the Polish branch of the Unilever group.